As locals well know, Salt Lake City is one of the nation's most outdoor-accessible major metropolitan areas. Where else in the country can you find 1.2 million people living next to so many premiere hiking, biking, skiing, and backcountry opportunities? Travelers flying into Salt Lake City can be skiing at one of four different resorts within an hour of landing. Mountain bikers in the city can ride straight from their doorstep to trailheads and parks for a variety of workouts and terrain challenges. 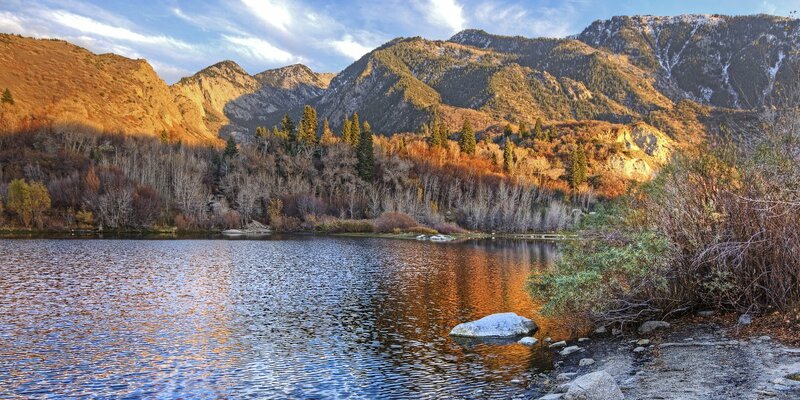 Hikers can leave work at the end of the day, make a quick trek into the Wasatch for stunning views of sunsets and city lights, and still be back in town for dinner. Snowshoeing, cross-country skiing, climbing…the plethora of abundant and close options make Salt Lake City a great hub for outdoor exploration. We’ve assembled a baker's dozen of the hikes that really should be on your list if you are spending time near the city for business or pleasure. Many of these trails are also fantastic for snowshoeing or cross-country skiing in the winter, as well. Of course, if you can afford the time to commute a little farther out, there are heaps of adventures to be had deeper into the Central Wasatch Mountains. Search our Central Wasatch region, and don’t forget that most of the mountain bike adventures are on multi-use trails that are also very popular hikes. For this list, however, we’ve tried to focus on trips that take less than an hour’s commute round-trip. Ferguson Canyon Trail Hike: Swimming holes, climbing, and incredible views, all just 20 minutes from downtown. The Living Room Hike: Kick back on a rock pile sofa and enjoy the sunset from Red Butte Ridge. Mount Olympus Hike: A Salt Lake City classic, this hike gains 4,000 feet in just under 4 miles to reach the summit for amazing views of the valley. Bells Canyon and reservoir. Photo by Kyle Jenkins. Lake Blanche Trail: This beautiful lake sits right under the Sundial just under 4 miles from the trailhead, but be prepared for some elevation gain. Antelope Island State Park: Resident buffalo, bighorn sheep, excellent migratory bird watching, and miles of terrain to explore. A very unique opportunity. Maybird Lakes Hike: With nearly 2,000 feet of elevation gain, this is a rewarding hike with great views of Pfeifferhorn. Bells Canyon Trail Hike: A short drive and a short walk will lead to great views from the reservoir, but take the Bell Canyon Trail farther up to the waterfall if you have the time. Stairs Gulch Hike: Just 20 minutes from the city and a few miles from the trailhead, enjoy some beautiful views from Big Cottonwood Canyon. Secret Falls Trail: This multi-tiered cascade sits just more than a mile from Highway 210, and it is well worth a stop, especially when the flows are high. Grandeur Peak: This hike is a workout, but you’ll enjoy tremendous views year round. There are good routes up here for climbers. Big Mountain Summit Hike: With a round-trip distance of 5 miles and 1,000 feet of elevation gain, this accessible summit provides a great escape from the city. Storm Mountain Day Use Area: Truly a multi-use area that appeals to anglers and climbers, hikers also have plenty of trail options here. Mount Aire Hike: For spectacular views and easy access, this adventure really can't be beat. A great spot for a sunset at the end of your day.